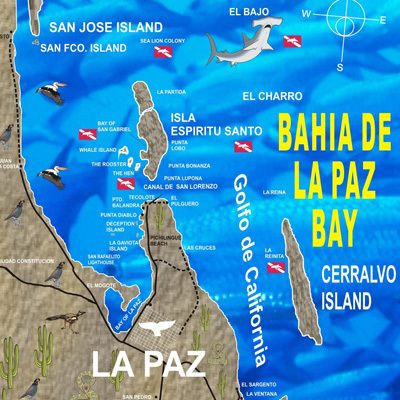 This report is based on a trip that Island Dreams' owner Ken Knezick made to the Sea of Cortez, Mexico in August 2013. He was invited to sail on the maiden voyage of the region's newest live aboard dive boat, the M/V Valentina. 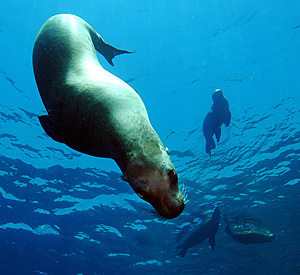 A highlight of the trip was swimming with the sea lions of Los Islotes and Animas. We hope you will find Ken's report of value...so let's dive in! LIFE IS ABOUT CHOICES -- When exiting the San Jose Del Cabo (SJD) Airport, travelers are faced with an interesting decision. To the south lies the burgeoning tourist mecca of Cabo San Lucas. Super deluxe resorts hug the coastline of the brilliant blue Sea of Cortez, while high-rise condominium projects sprout beside the busy four-lane highway. Already host to 25,000 hotel rooms, with more in construction, Los Cabos follows only Cancun and Playa del Carmen in Mexico's large-scale tourism plans. 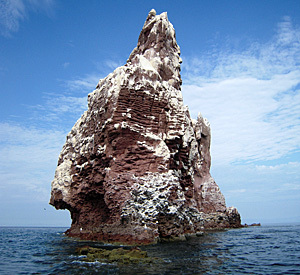 But if, like me, your ideas of adventure range beyond $150 rounds of golf, tiresome time-share touts, and yet another Hard Rock Café or Planet Hollywood, then you may be tempted to turn in the other direction, north towards La Paz, and some truly excellent scuba diving. RIDING BACK IN TIME -- The winding highway leading to La Paz is bordered by a thorny array of cactus plants and scrub brush, interjected occasionally by splashes of color from blooming acacia and bougainvilleas. Immediately beyond the airport, the terrain becomes a mix of convoluted canyons, wide dry arroyos, and the rare spring-fed oasis of green. Cattle range freely, scrounging for their sustenance while squadrons of turkey vultures circle languidly overhead. Wild yet inviting mountains punctuate the distance. For a moment I fancy I'm a cowboy in an old western movie. But the fortunate reality is that I'm riding in a fine new air-conditioned Suburban, listening to a CD of lively ranchero music and practicing my Spanish with the congenial driver, making the 2-½ hour trip to La Paz quite pleasant. SEA OF CORTEZ ATTRACTIONS -- As befits an ocean-side paradise, featured activities in Baja California include scuba diving, snorkeling, kayaking, whale watching, horseback riding, hiking, ATV tours, beach combing and good old fun-in-the-sun relaxing. Anglers come from around the world to try their luck in the bountiful Sea of Cortez. 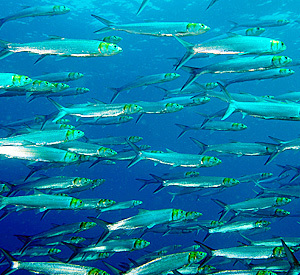 Changing with seasonal migrations, the catch includes Striped Marlin, Blue Marlin, Black Marlin, Sailfish, Yellowfin Tuna, Dorado, Roosterfish, Mackerel and Wahoo. M/V VALENTINA -- My preference is to catch fish with my underwater camera, so the primary reason for this visit was to join the maiden voyage of the M/V Valentina, the newest live aboard serving the Sea of Cortez. Under new ownership and management, this vessel was previously the Baja Aggressor. Valentina is a very solid steel-hulled ship, 130 feet in length. She has ten cabins, all on the main deck, to serve a maximum of 20 guests. Each cabin is equipped with individually controlled A/C, private restroom and shower. I appreciated the good reading lights and considerable storage space. 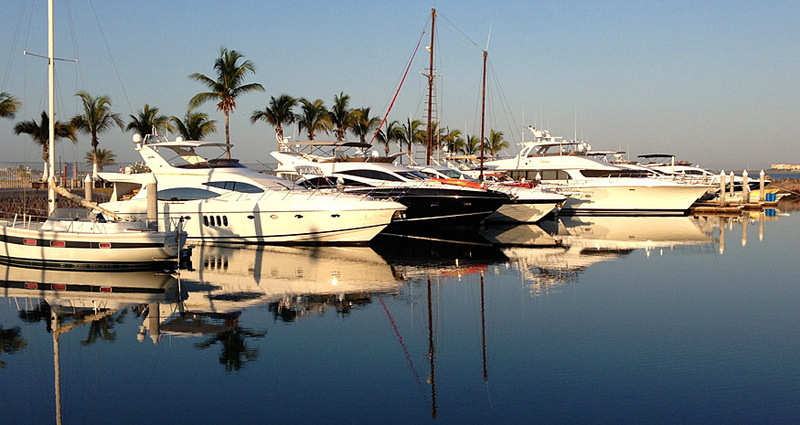 The boat is very well-laid-out for scuba diving, with a large salon/dining room, spacious dive desk, and upper sundeck. Nitrox is readily available. Diving was from large inflatable Zodiacs, and only occasionally right off the main vessel's dive platform. The food, mostly Mexican cuisine, was very good. Cruise price encompasses lodging, diving (up to four dives per day), meals, and beverages, including beer, and at some meals, wine. There is a well-stocked bar where liquor and cocktails may be purchased. The crew, from Captain and Chef, to divemasters and small boat operators, proved to be excellent - friendly, hard-working, and fully focused on guest satisfaction. 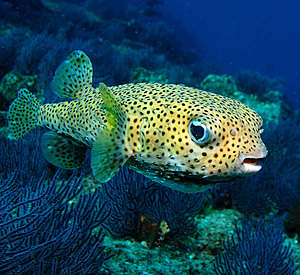 THE SCUBA DIVING -- It must be made clear that Sea of Cortez diving is much different than what you may have come to expect in the Caribbean or the Asian Pacific. Wide annual variations in water temperature permit only limited growth of hard corals in the Sea of Cortez; so much of the bottom strata are volcanic rock formations. Fortunately, the scarcity of corals is more than compensated for by the profusion of marine life to be found. 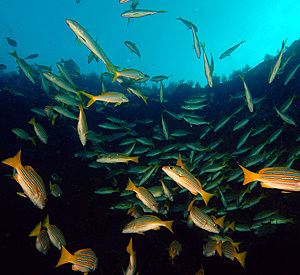 Underwater attractions feature large schools of fish - jacks, snapper, mullet, pompano and the like. 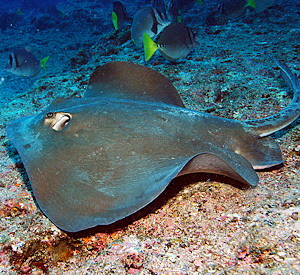 Sightings of manta rays, mobula rays, bat rays, eagle rays, and even whale sharks are not uncommon. 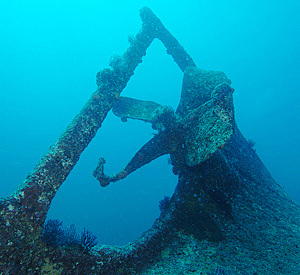 There are some excellent shipwreck dives. 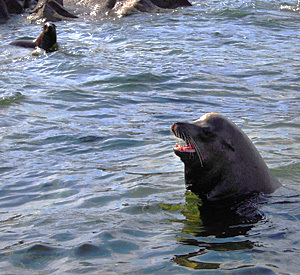 On some dive sites, sea lions are routinely encountered. The best dive sites near La Paz include Los Islotes, El Bajo, and Animas. These renowned dive sites, and more, are all included in M/V Valentina's itinerary. 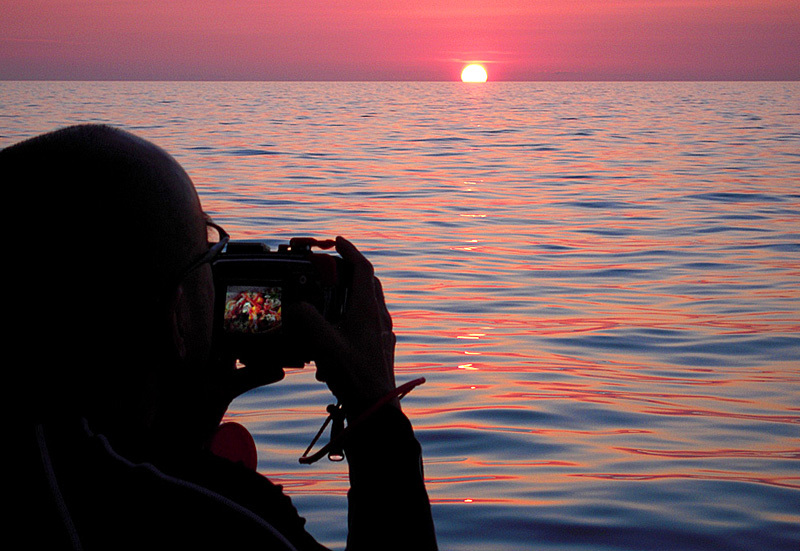 Dive experiences and wildlife encounters only dreamed of elsewhere become commonplace in the Sea of Cortez. 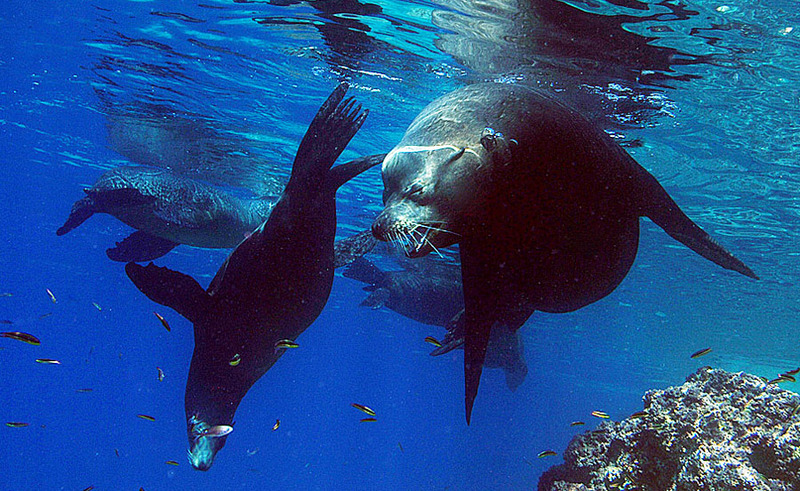 SWIMMING WITH SEA LIONS -- A major highlight of any trip to the Sea of Cortez is the opportunity to swim with the resident sea lions. As opposed to whale sharks and manta rays that roam the open ocean, sea lions live in well-fined rookeries, and you are pretty much guaranteed to see them. 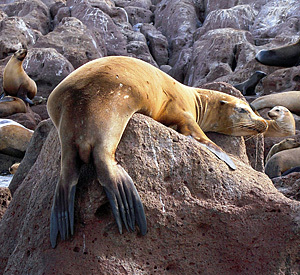 Sea lions live in loose family groups of one large bull, with a harem of females and their offspring. The bull's job is to act tough, protecting his family from encroachment by rival males, and anyone else. The females guard their young, but are curious about "guests." 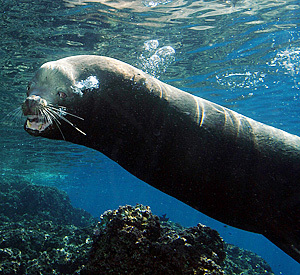 Later in the season, when the baby sea lions are larger and more unrestrained, they may well approach to within touching distance, pulling at your snorkel, or nibbling your fins. 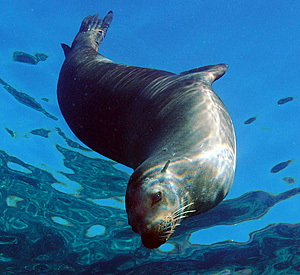 While seemingly clumsy on land, sea lions are fabulously acrobatic swimmers. It is a joy to be in the water with them, much less to be lucky enough to get a few photos. LAND-BASED OPTIONS -- Should you prefer to lodge on land rather than liveaboard, the same company offers daily day-boat dive trips combined with a nice range of La Paz hotel options. These include the Hotel Marina, Hotel Araiza, and Hotel Costa Baja. They also own a transportation company, and can easily provide your car transfers between Los Cabos and La Paz. Island Dreams stands ready assist to you with your selection and arrangements. If you do opt to lodge on land, expect boat trips of 1 - 1.5 hours to the best dive sites, and two or three dives per day. SEASONALITY -- This is a region where visiting at the proper time of year is critical to the success of your holiday. 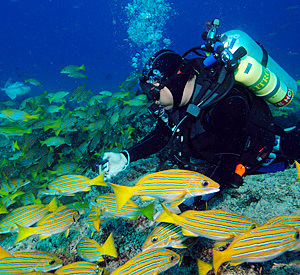 If visiting the Sea of Cortez for scuba diving, you may expect good conditions June through November. Prior to June, water temperatures are relatively quite cold. By the end of November, the winds have changed direction and sea conditions will deteriorate. Barring a hurricane, best conditions and warmest water in the Sea of Cortez may be expected during August, September and October. December through May, the Valentina will be sailing to Socorro, the remote and wonderful diving 200-miles south of Cabos San Lucas. THE BOTTOM LINE -- Baja California Sur is a wonderfully unique natural environment - I describe it as "Arizona by the Sea." For beautiful coral formations, visit Cozumel, Indonesia, or the Philippines. But for big animal action your best bets are Galapagos, Ecuador; Cocos, Costa Rica; and Mexico's Sea of Cortez and Socorro. Of these options, the Sea of Cortez is by far the most accessible and affordable. Should you wish to dive the Sea of Cortez, I can think of no finer option than the M/V Valentina live aboard. Seasonality is the key to a great trip, but truly inspiring diving awaits those who are ready for something new and exciting. I invite you to fly to San Jose del Cabo, and turn north to the road less traveled, where you may enjoy your own Baja California adventures. "Wishing you great diving, and a world of adventure!" Island Dreams has detailed knowledge of Cozumel and the Caribbean. You are invited to call or e-mail for additional information, advice, and/or assistance with bookings.